Can I be straight up with you? Narcissists destroy good people. If you have reason to believe that your partner is a narcissist, your future and your health are in grave danger. Over the last three and a half years, I’ve read many hundreds of stories depicting how the lives of victims of narcissistic abuse were destroyed. I’ve also worked with hundreds of clients in every imaginable situation, and I’ve seen firsthand what happens when one continually gives the narcissist the benefit of the doubt. I know you were raised to believe that goodness always prevails, to turn the other cheek, and to help those you love who are in need, but when it comes to narcissists, those beliefs will bring you crashing down in a heap of flames. Narcissists are extremely good at making you believe they are on the mend, that they will treat you better, and that they’ve finally had The Divine Epiphany. You know, the one where the angels parted the clouds in a glorious moment of melodic, celestial descension, touching down and instilling divine insight into the narcissist’s brain, revealing how much they need you in their life and how sorry they are for all the pain they’ve caused. But, it’s all a scheme to destroy you. In particular, there are five narcissistic behaviors and schemes that really bother me. If you’re struggling to detach from the narcissist, to resist their hoovering, or are feeling fed up with yourself for the number of times you’ve forgiven them, chances are it’s because you’ve bought into one or more of these schemes. Scheme #1 – They successfully accomplished their recent hoovering mission and now the two of you are rekindling your love and vowing your unending devotion to one another. If the narcissist recently wedged their way back into your life, you may be feeling particularly blissful, especially that the Christmas season is officially upon us. Perhaps you feel so utterly wonderful that you are excitedly making plans for New Year’s Eve. The reason you feel euphoric right now is because the narcissist likely promised to give you all the things you need to help you feel emotionally safe. This has released high levels of dopamine in your brain. In fact, it’s not only that the narcissist is back in your life that has you feeling so ecstatic, it’s the anticipation of an improved future with them that’s sustaining your biochemical high. This scheme is part of the narcissist’s hurt and rescue mission. They may have “rescued you” after a recent silent treatment or your discovery of their affair partner, but they are secretly planning to push you off the cliff again soon. This hurt and rescue process is how they maintain your symptoms of trauma bonding and cognitive dissonance. If you’ve recently let the narcissist back in after a stint of exceptionally good hoovering, prepare yourself for what’s coming. Scheme #2 – You recently found out they’ve been seeing someone else, and their response was to disappear off the face of the earth. Of course, the whole time they’re gone, you obsess 24/7 over what they are doing with their affair partner, going down checklist of all the possible reasons they cheated on you. Ultimately, you feel so unattractive and uninteresting, you begin to idolize the narcissist and embark on all the things you’ll do to improve yourself and win back the narcissist’s love. When the Narcissist eventually returns following their crippling silent treatment, you will be emotionally defenseless and more prone to accepting their offensive behaviors in order to avoid their leaving you again. It may even lead to your pleading, apologizing, and begging the Narcissist not to leave, even when you have done no wrong. This scheme is designed to trigger your abandonment wounds and destroy your self-esteem. Over time, your abandonment wounds will run so deep that you may eventually accept their having another lover and put yourself into the role of The Fallback. In this way, the narcissist can extract copious amounts of supply from you because you’ll do anything to keep them in your life as you engage in the humiliating “Pick Me” dance. Don’t let yourself fall into anxiety and depression by thinking there’s something wrong with you. Narcissists do this to everyone, so try your best to not take it personally. Scheme #3 – You’ve been talking divorce with the narcissist and they say you should avoid lawyers and save your money. They may even go so far as to write up an agreement with you, making it appear they are willing to be reasonable and give you your fair share during the separation. Typically, narcissists don’t play fair when it comes to divorce. In the beginning, they often pretend to be fair and civil, but it’s only a matter of time until you discover the truth. During the initial stages of my own divorce and custody proceedings with my Ex, I fell for the “we don’t need lawyers, let’s save money” trap and showed up to our first hearing alone, expecting that we would settle things between ourselves and the Judge. My Ex showed up with an attorney and they had secretly written up a divorce agreement, springing it on me about three minutes before we went before the Judge. I had two minutes to examine it. It seemed fair enough, so I signed it. Big mistake. It was so vague that the attorney I later retained wondered how in the world a Judge would sign off on it. Of course, it was intentionally vague to give my Ex various freedoms and as little accountability as possible. Another trap they’ll spring on you is calling you greedy or that if you’ve been a stay-at-home mom and/or homemaker that you don’t deserve anything, or – the all-time whopper – they’ve had The Divine Epiphany and discovered they don’t want to divorce you, after all. Narcissists want you to believe you are a greedy gold-digger so they can waltz away with everything. In fact, they truly believe you don’t deserve anything and will do all in their power to keep from splitting assets, paying alimony, or paying child support. If they see you’re not backing down, that they may have to split the joint property, or pay you any kind of support, they will often pretend to have had an epiphany (yet will continue their affairs behind your back). If you can, get a good attorney and a Private Investigator. Scheme #4 – Buttering you up and then asking you to give them money or enter into a financial commitment with them. I’ve lost count of the number of people I’ve worked with who have been financially devastated because they gave in to the narcissist’s seemingly genuine requests to give them a loan, start a business together, open joint accounts, and/or buy a house or vacation home together. They may also lend you money or pay for a big-ticket item to make you believe they are generous, but it’s only to instill in you a sense of obligation in preparation for the debilitating shaft you’ll get from them later. If you’ve been having problems in your relationship and believe your partner is a narcissist, it would be in your best interest to avoid mingling your finances in any way. 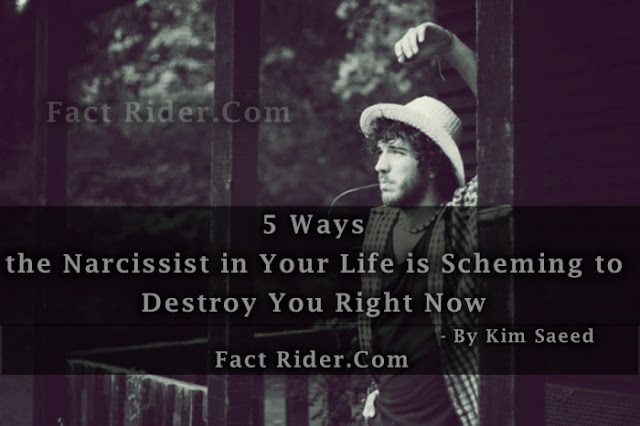 Scheme #5 – Just when you think you have made the narcissist happy, they pull the rug out from under you. The ultimate indicator that the narcissist has gained complete control over you is when you are consumed entirely with making them happy. From the very beginning, the narcissist has groomed you to relinquish everything that is part of your personality: the way you dress, your interests, your friends, your family, even the bond you have with your children. In fact, you may be so consumed with making the narcissist happy, you’ve barely noticed that everything that has been dear to you is slipping through your fingers like quicksand. The narcissist achieves this by grooming you to anticipate their every need. No longer do you care about your appearance, your plans for the future, or the state of your career (other than to lament that those things are lost causes, anyway). All you care about is making sure you’ve appeased the narcissist in order to win their approval. However, the very nature of narcissism decrees that you, as their target, can never feel satisfied or safe in knowing you’ve made them happy. Therefore, the very moment you feel pride in knowing you’ve accomplished something they’ve made clear is required to stay in their good graces, they will pull the rug out from under you. This is often described as their “moving the goalposts”, “the never-ending prospect of redemption”, and the almighty “no-win situation”. Not only does this result in your becoming an excellent source of supply for them, it will lead to the destruction of your mental and physical health, leading to Narcissistic Abuse Syndrome. Additionally, I’ve read countless stories of targets who’ve had to go on psychotropic medications, who developed certain cancers, who lost their cognitive functioning, developed IBS, developed fibromyalgia, lost their adrenal function, or, shockingly, committed suicide. In fact, I have symptoms of chronic fatigue, fibromyalgia, and lowered adrenal functioning myself. The good news is that you can turn it all around. When you’ve eliminated the risks you can control, you can dive in and start clearing your path to healing. If you hit a road bump or make a mistake, brush yourself off, learn something useful from it… and then pick yourself back up for another round. Are you ready to make that leap?